Walk into any liquor store and you’ll see hundreds of options. You can zero in on someone’s favorite drink when picking a gift, or you can get creative and choose something they wouldn’t buy for themselves. Also, remember that you don’t want to come to a party empty-handed, so get in the habit of at least bringing a bottle. And for more gift ideas, check out the other categories in our Holiday Gift Guide. If you have a beer lover on your list, you can give him or her the gift that keeps on giving. 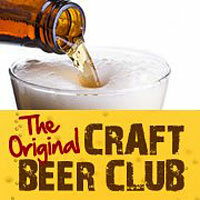 The Craft Beer Club discovers exceptional craft brews from around the country and delivers them each month direct to you or your gift recipient. Every selection is produced by small-production, independent brewers who use only traditional brewing ingredients and time-honored brewing methods. In addition to traditional bottled beers, they also embrace the hundreds of small craft brewers around the country that offer their hand-crafted beers in cans. It’s a great way to enjoy craft beers and it’s ideal for the holiday season. If dad, your buddy, your tomboyish gal pal or anyone else on your holiday list loves a very good bottle of Scotch, then consider this rather dandy, unusually enjoyable single malt. 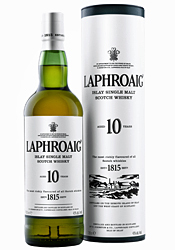 Outstanding on the rocks, with a splash of water or soda, or neat for you purists, the Laphroaig 10 Year Old is also more mixable than you might assume; on the other hand, it’s good enough that many will consider even the finest cocktail made with it a crime against nature. The website tells us that it’s got traces of salt and seaweed along with the usual peat and smoke flavors, but we don’t completely agree. It’s definitely got smoke – indeed, you might get hungry for barbecue after you take a good whiff and, yeah, that’s some salt in there, but that’s not all. Every good Scotch has its share of several indescribable tastes and smells of nature. We haven’t been to Scotland, but we wouldn’t be one bit surprised to find ourselves tasting the essence of this concoction in the clear cool air of the highlands. Cheaper than super-duper premium single malts but nearly double what you’ll likely pay for Chivas Regal, this is an outstanding gift for a true blue Scotch enthusiast. If you’re in search of a bottle for the man or woman who’s drunk everything, Brugal 1888 is something genuinely new under the sun and it’s completely remarkable. An aged Dominican rum that thinks it’s a premium Scotch or Bourbon, it has the tantalizing, woody and astringent flavor you might get in very a high-end single malt, plus a hint of something that somehow reminds us of our dad’s old fake-leather chair. (That’s a good thing, believe it or not.) At the exact same time, it has a boldly sugary undertone that goes well beyond what you’re likely to find in the sweetest bourbon. We tasted more than a hint of maple syrup or maybe turbinado. Regardless, it’s delicious and probably not like anything you’ve had before. You can drink this on the rocks, with a bit of water, or neat. You can also put on your mixologist hat and go to town as this is a flexible beverage that won’t be out of place in an Old Fashioned, especially if you use real maple syrup in place of the usual sugar or simple syrup. High priced for rum but worth every gosh darn penny, this is one boozy gift that won’t be forgotten. This is the best new spirit we’ve tried in a long time. Cabo Wabo is known now just as much for its excellent tequilas as it is for its founder Sammy Hagar, and this new Cabo Diablo should attract many more fans. 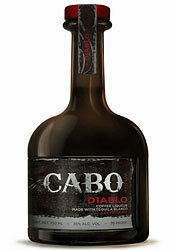 Cabo Diablo features a delicious coffee flavor and tastes amazing when you drink it straight. It’s sweet, but not too sweet, and it’s not think and syrupy like some liqueurs. So it’s a fantastic sipping drink that men and women should both enjoy. But better yet, it’s a tequila, so it’s also a great way to get a party going, as tequila makes everyone a little nuts at times. It is made with 100% blue agave Cabo Wabo Silver tequila, then kicks in notes of fresh roasted coffee, vanilla and chocolate for a striking combination. It’s excellent served chilled or on the rocks. With the holidays around the corner, this makes for a great gift for men and women, and it’s a great bottle to bring to a gathering to get the party started! 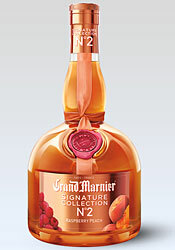 The smooth and delicious Raspberry Peach by Grand Marnier is from its new Signature Collection. It features an all-natural fusion of fresh fruit ingredients and exotic orange essence, blended with premium Cognac. Here’s how they describe it: “The House of Marnier Lapostolle is proud to present our latest expression, Signature Collection No. 2 Raspberry peach. The natural flavors of succulent European raspberries and rare red peaches from Ardèche, in the South of France, are combined with world-renowned Grand Marnier, made from our exceptionally smooth Cognac and wild tropical Haitian oranges.” It sounds incredible, and it totally lives up to the hype. Just pour it into a cocktail glass with some ice and you have a delicious drink with a nice kick. If you’re a fan of Grand Marnier, you have to try this, and we recommend it to anyone who enjoys spirits. Women in particular will love this, and it’s great for cocktails as well. We’re huge fans of HBO’s “Game of Thrones” and we were very happy when HBO and Brewery Ommegang sent us some bottles of their new “Game of Thrones” beer to try out. We tried the second in the series, called the “Take the Black Stout,” which was inspired by the Night’s Watch, the military order dressed in black which guards The Wall. The unique label features the sacred Weirwood tree where Jon Snow and other followers of the old gods take their oaths to the Night’s Watch. “With the second beer, we wanted a big, substantial brew, something that would stick to your ribs and sustain you through long nights at watch on The Wall,” said Phil Leinhart, brewmaster at Ommegang. “A 7 % ABV stout with Northern Brewer hops, Midnight wheat, roasted barley, and chocolate malt made a perfect foundation for the beer. We also used uncommon spicing, something Ommegang is well known for. For this beer we added licorice root and star anise.” We tried it and loved it. It’s thick and malty and exactly the kind of beer you can imagine the characters drinking on the show. It’s a great gift for fans of the show or anyone who loves trying hearty and unique beers. You can also spice up a holiday party by serving this or bring it along. The beer comes in large, 750 ML bottles with a cork, so it makes quite an impression. Here’s a limited edition spiced rum from Captain Morgan that offers a very nice twist on a classic. You can tell the difference right away when you open the bottle, as you can definitely sense dark cherry scents along with a hint of vanilla. The taste is excellent, with a hint of sherry wine to go along with the dark cherry flavor. Frankly it’s delicious on the rocks and should work great with many rum cocktails. We tried the classic rum and cola combination and loved it. This special edition was inspired by the real-life Captain Henry Morgan’s 1671 victory in Panama aboard his flagship, The Satisfaction. The bottle design is slick as you can see, with a highly-detailed metallic label. It will definitely look good on your home bar and your guests will be happy to try something new and both men and woman will enjoy this one as a gift. 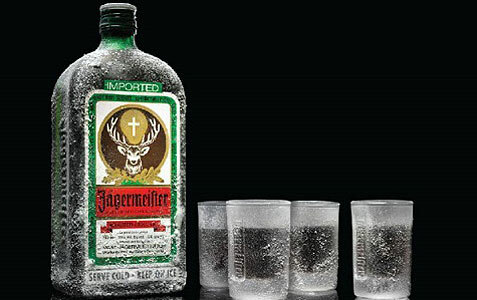 Every party needs shots at some point, and you’ll definitely want some Jägermeister on hand when that time comes. This classic brand can help liven up most events, and it’s a great bottle to bring along to a party. It will also be a great gift option for many people on your list, as this is a must for anyone’s home bar. Flavored liquor has become all the rage over the last few years, particularly with twentysomething women who would never consider drinking a shot of vodka unless it tasted like strawberry shortcake, rainbow sherbet or some other sugary concoction. 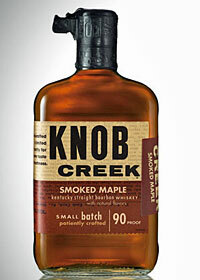 The last thing we expected, however, was for this trend to make its way into the whiskey market, though Knob Creek’s Smoked Maple bourbon is actually pretty damn tasty without sacrificing what’s most important. Launched in September of this year, the Smoked Maple variation was created in honor of Knob Creek founder Booker Noe, bringing together his three favorite flavors: smoke, maple and bourbon. Bottled at 90 proof with a smokey and sweet finish, the maple flavor is noticeable but subtle, never overwhelming the bourbon itself, and it makes for one hell of a Manhattan or served straight up. We weren’t daring enough to try it with a plate of waffles and bacon, but we’re sure it would pair nicely as well. Real men love gin, so a proper British gin will always be appreciated as a gift or as a bottle you bring to a party. 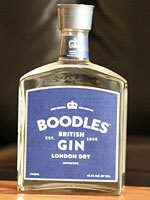 Boodles Gin is named for the oldest gentlemen’s club in England, the Boodle’s Club, which was founded in 1762 by future Prime Minister Lord Shelbourne, and Boodles Gin was allegedly the favorite of club member Sir Winston Churchill. Boodles was first distilled in 1845 and offers a unique flavor. It is a juniper- and coriander-based gin, distinct for having a more understated juniper flavor and unique profile. Boodles is the only gin made with nutmeg, sage and rosemary, and is free of citrus ingredients for a pure, proper taste. This classic, British gin can easily be enjoyed in a martini or a Boodles and tonic. Do you know anyone who is a fan of the hit PBS show “Downton Abbey?” If so, you can give them a gift that lets them enjoy wines similar to those poured by Mr. Carson for Lord and Lady Grantham. 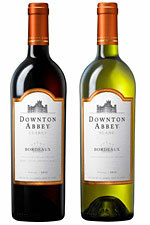 The Downton Abbey Wine Collection features two blends from the Bordeaux region of France: a “Blanc” white wine and a “Claret” red wine. Downton Abbey Blanc is a light and crisp white blend, while Downton Abbey Claret is medium-bodied red with bright fruit and a silky finish. We tried both of them and were impressed, and the price ($14.99 per 750-ml bottle) is reasonable as well. The wines are available in select stores and also online at Wine.com and DowntonAbbeyWine.com. If you’re bringing beer to a party, make sure you’re bringing something good. 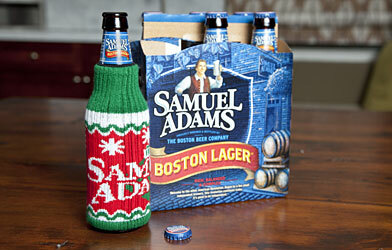 You can’t ever go wrong with Sam Adams, and the Winter Lager offers something unique as well. It’s a bold, rich bock beer that’s smooth with a malty finish and low bitterness, and most beer lovers will appreciate it. It carries on the tradition started with German brewers centuries ago when they created bold bock beers for the winter. Winter Lager has “a warm aroma of fresh-ground cinnamon and ginger” which certainly seems like a good fit for the holiday season. We always recommend at least one tequila, as it’s usually the best way to get a party started. Give a quality tequila as a gift or bring a bottle to a party and you’ll definitely get a great response. Alacrán tequila is a new, high-quality tequila blanco made from 100% agave. It’s smooth and delicious and comes in a beautiful matte black bottle. It’s great as a sipping tequila, and of course, for shots and mixed drinks as well. Enjoy the party! Do you know someone who appreciates the finer things, like a great Scotch and a nice cigar? 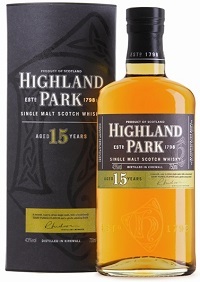 Check out Highland Park 15, which was first released as a UK exclusive in 2003 and is now globally available. This Scotch is a very smooth single malt aged 15 years with a nice, smokey finish. Keep this one in mind when shopping for gifts for the Scotch-lover on your list or as you’re stocking your home bar. Also, check out our Father’s Day Gift Guide from earlier this year for more booze gift ideas, along with our beer reviews and wine reviews. Also, check out our Drink of the Week series for great cocktail ideas for your holiday party.